The variations seem to be in the area of how far you stretch up and down and whether or not you bend your knees or raise your heels. Lots of different combinations for you to try out to keep the chi flowing! It looks as though your arms are like the sails of an old fashioned wooden windmill first turning clockwise then turning anti clockwise in the wind. 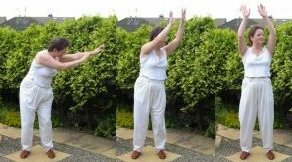 some teachers teach this chi gong exercise so that your arms are fully extended upwards and touch the ground on the down path. We dont  its too easy to strain muscles if you are not used to exercise. So remember to work within your own comfort zone. the discs in the vertebrae of the neck should be protected Only tilt head slightly downwards and upwards to avoid crunching the cervical discs together. always do things slowly and comfortably  Tai chi and qigong for health and relaxation are not meant to hurt! - ever!